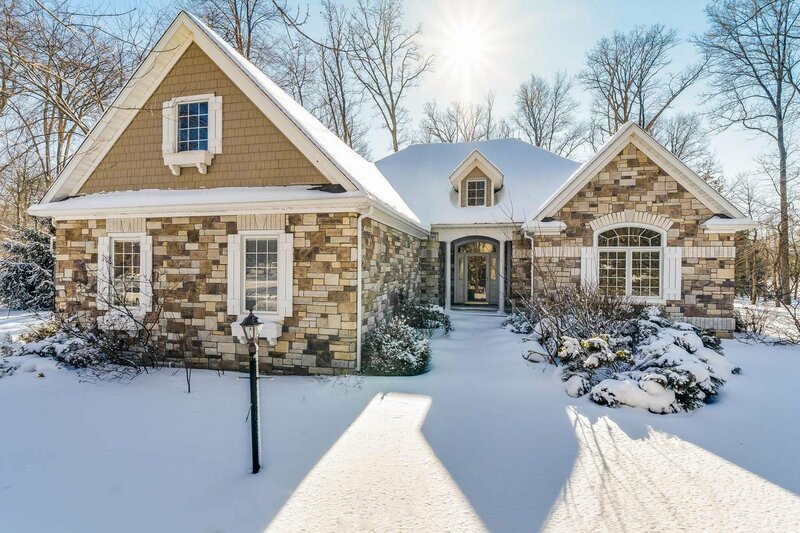 This outstanding high quality Granger 5 bedroom ranch is located in the woods of the Fox Chase neighborhood ....within the Penn School System. This open floor plan has nearly 4100 square feet of finished living area including the finished daylight lower level. Enter the home into the open and inviting foyer with hardwood flooring. This leads into the Great Room with stunning cathedral ceiling, exposed beams, and stone fireplace. The chef's kitchen features stainless appliances, corian counters, granite island, white cabinetry, and access to both the dining area and sun room. Enjoy access to the large covered deck and huge stamped concrete patio - great for entertaining or enjoying the large backyard in the woods! The main level master includes a walk-in closet and luxurious bath with tile freedom shower, jet/garden tub, and a double sink vanity. Two more bedrooms have access to another full bath with double sinks. The Large laundry room includes cabinet, ample counter space and a utility sink. Downstairs, the daylight lower level adds more living/rec room area, a kitchen/bar with cork flooring, fridge, sink, and stove/oven, two additional bedrooms, and a full bath. The attached spacious 3-car garage features a stairway to the unfinished portion of basement for ample storage. Schedule your showing today!